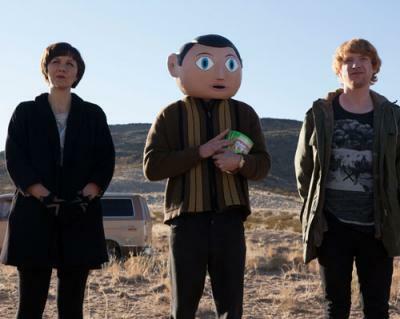 Fassbender may have his face plastered on magazines, but in *Frank, he shows off his acting skills while trapped inside a head made of plaster in Lenny Abrahamson's 2014 movie flick. Over the past five years, Michael Fassbender has made an impression in the movie industry through performances in films such as 12 Years a Slave, X-Men: First Class, and Inglorious Basterds. Fassbender may have his face plastered on magazines, but in Frank, he shows off his acting skills while trapped inside a head made of plaster in Lenny Abrahamson's 2014 flick. While some actors have long makeup sessions or do weight training to fully become their characters, Fassbender wore a large, fake head to take on the role of Frank, an avant-garde musician who hides his own face away behind an unblinking, smiling manufactured face. *Frank, which will be shown as part of the Edinboro Film Series Thursday, Sept. 11, centers on Fassbender's enigmatic character and his band after the addition of a new member, which leads to intriguing opportunities for the eccentric group with comical results.